Smart-Clip2 Software v.1.09.00 and Smart-Clip2 Firmware v.1.09 are out! Are you ready for the BIG BANG?! Brace yourself, cause it's not a theory anymore! Observe the genesis of new Universe! Welcome Smart-Clip2 Pack 4 - the successful implementation of breakthrough ideas in innovative solution. It will transform the future of GSM world. Just check what's inside this new Pack! * Please be warned that these models are in beta test mode. We’re doing our best to add these models officially to the list of supported as soon as possible. 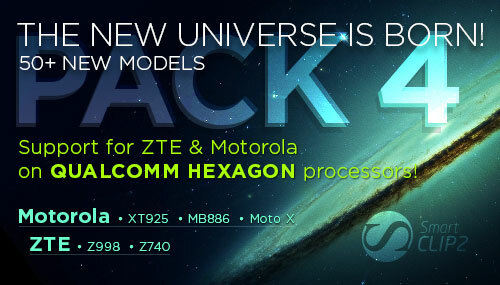 It’s potentially possible to service phones of other brands that are powered by Qualcomm Hexagon processors. We welcome you to test new devices and share your experience with us. This solution is available as a virtual product - Pack 4 activation. The most common questions about Packs are collected here.